PORTAGE PARK — Sometime between Led Zeppelin's release of "Stairway to Heaven" and the launch of the Apollo 13 mission, Jefferson Park residents were in the streets protesting the construction of affordable housing. At an academic panel discussion at Filament Theatre, 4041 N. Milwaukee Ave., historian Nick Kryczka showed the proof: a 1971 Tribune photo of a demonstration outside the Milwaukee Avenue office of 45th Ward Ald. Edwin Fifielski, demanding that the alderman squash a court mandate to build scattered-site public housing around the ward. Neighbors would return to the same address 46 years later to take up the cause again. 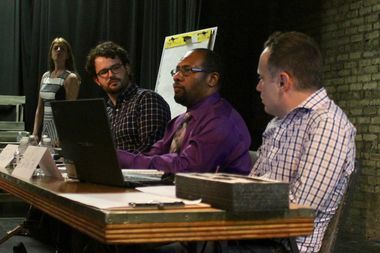 Kryczka was one of three researchers convened on Thursday by the group Neighbors for Affordable Housing in Jefferson Park to wrap context around the neighborhood's ongoing dispute over a 100-unit mixed-income apartment complex proposed for 5150 N. Northwest Hwy. Through presentations on the "past, present and future" of citywide housing segregation, the panelists laid out a post-mortem explaining why so many efforts to build affordable housing in the neighborhood had failed. Then, they argued why it's worth another shot. "The depressing news is that some things have not changed since 1971," Kryczka told the crowd of about 70 people. "Low-income renters can be used as a political football among a certain brand of racial homeowner politics ... but this brand of racial politics is not destiny." The apartments proposal by developer Full Circle Communities drew a seismic backlash when it was unveiled at a public meeting in February, when hundreds of neighbors blasted the plan for fear that it would attract crime and drain nearby property values. But the seven-story building's 80 subsidized units would barely make a dent in the area's growing hunger for affordable housing, according to Daniel Kay Hertz, a senior policy analyst with the Center for Tax and Budget Accountability. Hertz pointed to a report published in May by the Institute for Housing Studies at DePaul University marking more than 11,400 "low-income households" in Jefferson Park and Portage Park but fewer than 8,000 "low-cost houses" between the two neighborhoods. "So there are about 3,500 Jefferson Parkers and Portage Parkers who already live here, for whom there simply is not low-income housing for them to access," Hertz said. "And housing affordability is increasingly an issue for working class and middle class people as well." All across the city's Northwest Side, the construction of towering new high-end apartment complexes is pushing up rental values — a "threat to affordability" accelerated by the demolition of older, cheaper two-flats and three-flats, Hertz said. The result is a landscape where about a third of residents are paying more than 30 percent of their income toward their rent or mortgages. Ald. John Arena (45th), a chief backer of the Northwest Highway apartments proposal, offered a theory for why low-income housing remains unpopular in a neighborhood where thousands of residents would be eligible for it. "There's an innate disposition against people who qualify [for affordable housing], even among people who do qualify," Arena said. "So they'll vote against their own self-interest, because they don't want to identify with that population." Supporters of the plan have often ascribed racial animus to its opponents, an accusation opponents have fiercely rejected. 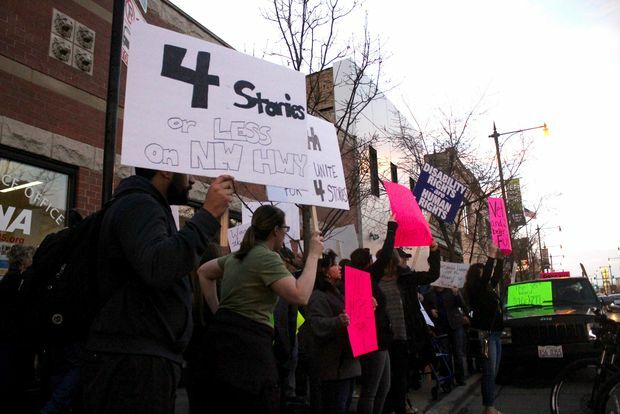 Leaders of the neighborhood group Northwest Side Unite, which formed in opposition to the new apartments and even funded a lawsuit to hold up their construction in court, have instead objected to the building's proposed height and argued that it could exacerbate school overcrowding. But no matter the neighbors' motives, they're fighting a proposal that would take a real — if modest — bite out of the area's endemic racial and economic segregation, according to Alden Loury, director of research for the non-profit Metropolitan Planning Council. Loury summarized the council's "Cost of Segregation" report, which this year imagined if Chicago's degree of racial segregation matched the national average for cities around the country. Under those circumstances, the city would have seen an extra $8 billion in economic growth, 83,000 more residents would have bachelor's degrees, and there would have been 229 fewer homicides in the city last year, the report estimated. Researchers at the council decided to take up the experiment after they "found that developers were often lamenting the cost of providing affordable housing," Loury said. "The question then became, 'What's the cost of not providing it?'" he added. "And the takeaway seems to be a pretty serious impact on quality of life for people all across the board."